Size: 5119 sq.ft. - 9900 sq.ft. Golf Place is a new project structured bythe reputable developers "Emaar Builder & Meraas Holdings". These Luxury villas in Dubai Hills situated next to the 18-hole championship golf course with an unmatched living experience. Golf Place at Dubai Hills is The Green Horizon in Dubai. Golf Place is a mega collection of 4 BR to 6 BR villas. The space of project allows availing benefit of front garden and rear garden area.As per location and depending on Bedroom size and Plot Size prices start from AED 6.3 Million-AED 16 Million. The completion is expected around April 2021. Golf Place villas community offersselection of 4 Bed, 5 Bed & 6 Bed luxury homes in architectural styles catering to different palates. The total built up area of the villas ranges from 5600 Sq.Ft and goes upto 9900 Sq.Ft where the land plot covers 7200 sq.ft to 17200 Sq.ft where residents/owner can prefer to accommodate a private pool. 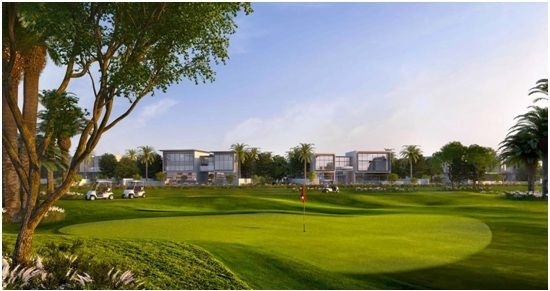 Golf Place is located beside the golf course launching 351 Villas of different layouts. Emaar Properties is a developer of integrated large sized community across Dubai and now has a significant presence in several key global markets. The company also has a diversified real estate development portfolio extending across shopping malls, hospitality/leisure& retail. Downtown Dubai is Emaar’s is being home to the iconic Burj Khalifa, The Dubai Mall and The Dubai Fountain.The group has truly constructed many marvellous constructions in Dubai and which are very much appreciated by the people. Avast 2700-acre spacethat will form an integral part of the Dubai Hills. The community is located Mohammed Bin Rashid City (MBR City). Dubai Hills space/land is owned by Meraas Holdings and the development is determinate by Emaar Group. Being vast land size of 11 million square meter Dubai hills will get more developed over a period of time.Golf Place nearby facilities contains54 km bicycle path, an 18-Hole Championship Golf Course, Two Hospitals,282,000 square feet Regional Mall, Three Schools, Parks /Open Spaces and 2 metro lines. The home of villas "Golf Place" is located in Dubai Hills Estate, Dubai, United Arab Emirates. Dubai Hills "City within a City" project Golf Place is nestled with Private Pool, Floor-to-Ceiling Windows, Two kitchens in each villas, Marble Flooring,a Retail Shops, Restaurants, Cafes Jogging or Cycling Trails, Tennis Academy and other basic & advanced facilities.